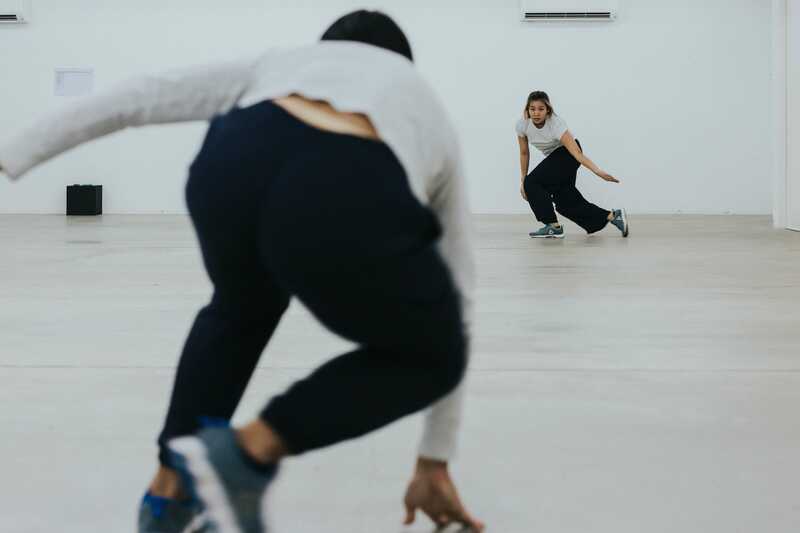 RAW Moves embarks on a mission to find the connection between bodies. There’s a scene early on in Close Company where the audience hears the sound of a moving train, reminding audiences of the crowded MRTs we sit on everyday. Company dancers Matthew Goh and Stephanie Rae Yoong are encased in a cloth bag, each attempting to find comfort within the limited space they share with each other. When they finally push their heads through an opening in the bag, there is a sense of relief that fills them both. That scene perhaps best sums up what dance company RAW Moves’ final production of the year hopes to achieve and bring to audiences. Collaborating with Australian choreographer Alison Currie, Close Company comprises a series of physical tests over three segments, conducted and performed by Matthew and Stephanie, as they explore issues of isolation, connection and disconnection, power balance and imbalance, emotional closeness, support and resistance in an increasingly crowded world. With Currie’s rather different perspective towards dance, the performance comprises of both dancers attempting to communicate and interact with each other in different ways, evolving and ‘improving’ on each method with each ensuing segment, and reflecting on their performance with factors like intensity, connection and closeness out of 10. What made this performance interesting was that it was split into three segments, and with every segment, we are made to move to different parts of the performance space. Audiences are given free reign to move around during the performance. However, over the three segments, the space changes. In the second segment, the space is halved. 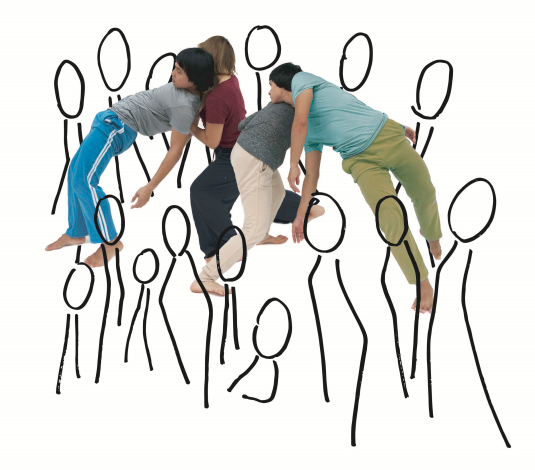 This allowed for audiences to take a different perspective towards the performance, noticing more details about the people around us and the dancers themselves, as the dancers got used to the new, smaller space and are required to improvise as they attempt to perform new versions of the ‘experiments’ in previous parts. 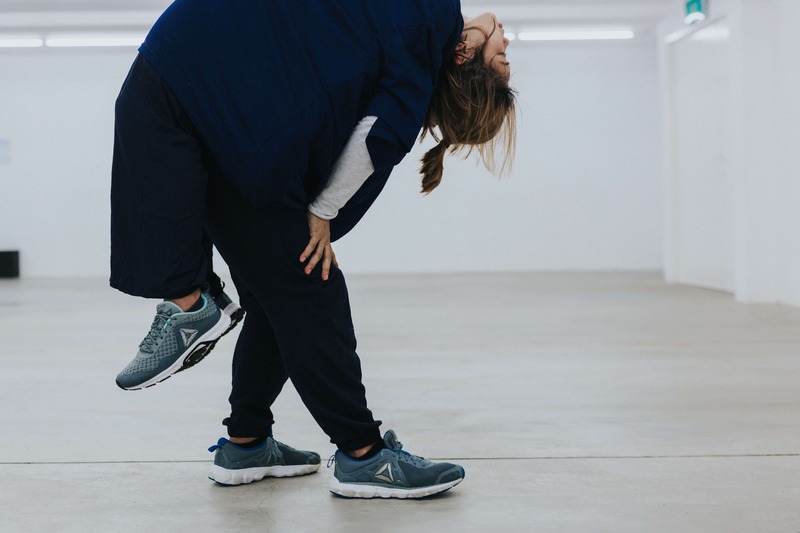 In the last segment of the performance, the space is halved again, with the dancers once again improvising and changing up their ‘experiments’ to suit the space. 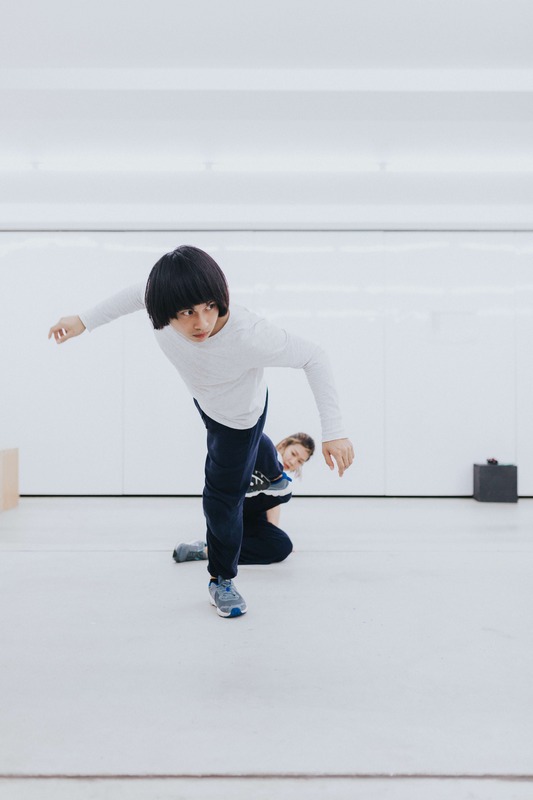 Audiences now feel closer than ever to the performers and each other, allowing us to reflect on how physical distance affects mental and emotional distance as well, and the way we connect to each other. 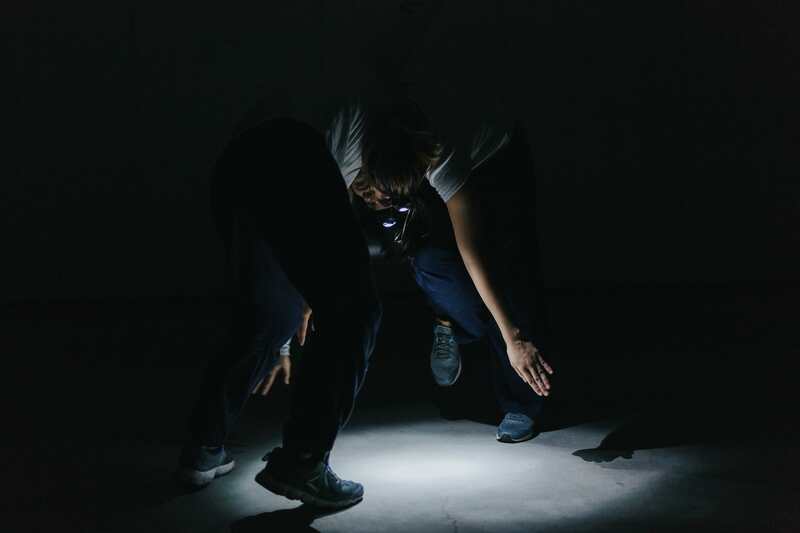 To start the performance off, Matthew and Stephanie begin by attempting to understand and perform each other’s movements in an act of mimicry, as they maintain eye contact with each other. Almost like a form of warming up to each other, they build a connection with each other and establish a relationship with each other. The ‘experiments’ then begin proper. In one segment, Matthew and Stephanie chart the length of their forearms (18cm and 16cm), their heights (160cm and 158cm) and more. While lying on the floor, they physically touch and connect to each other, adding up the values of their measurements, and one sees that these statistics are thus used as a basis for representing and measuring the physical distance between each other. As the houselights come down, the dancers enlist audiences to help them with our phones’ torchlights to help illuminate the darkened space in order to see the performance. There is the sense that the ‘spotlight’ is on them, as we listen to the sound of white noise in the background, almost as if they are in a crowded coffeeshop, and as they dancers make their way towards each other, there is a sense of sensuality that is felt, as the dancers are now fixated on each other, and lost in their own private world. A similar ‘experiment’ leads to a different effect in yet another scene, as Matthew holds a spotlight in hand, casting his silhouette on the wall and lighting his way through the audience as he comes face to face with Stephanie, a palpable tension in the air as they consider each other while the light shines directly on her. In another, the dancers take turns supporting and carrying each other on their backs, physically linked and connected to each other. The very essence of proximity and distance is explored by the dancers in every scene, such as when Matthew and Stephanie, seated on separate stools beside each other, spend the entire time texting each other on their phones, the ping of their messages audible to the audience members, exemplifying the paradoxical idea of being apart even when physically present. In another instance, they sit down in darkness, wrapping around each other with their bodies in an encroaching embrace. There is a distinct sense of evolution and strong coordination as they become increasingly familiar with each other, and the audience too feels emotionally invested in watching the way these experiments continue to develop. We feel a sense of loss as Stephanie hugs an empty space where Matthew used to be, and vice versa as Matthew ‘sits’ alone, devoid of Stephanie against his back. Close Company is an intriguing ‘experiment’ and exploration, where communication becomes the solution to connection and closing the distance created in crowds, or even simply between two people. Cleverly created over the course of workshops held between Currie and RAW Moves, it’s evident that there has been plenty of thought that has gone into the process and the way these ‘experiments’ have been curated, with the dancers effectively creating a strong camaraderie with each other and continually improving with each performance. It is a work that makes us appreciate the space we have even as we are often left at a loss as to how to negotiate it, a subtle reminder that even as we may never fully understand each other in our entirety, it is all we can do to reach out and begin trying.